Competing with robots isn't the only part of being an FRC Team. We also do outreach in our area to promote the ideals, interest in and knowledge of STEM. Performing outreach is a part of the Chairman's Award, the most prestigious award given by FIRST. The Chairman's Award honors the team that best represents a model for other teams to emulate, and best embodies FIRST's mission. 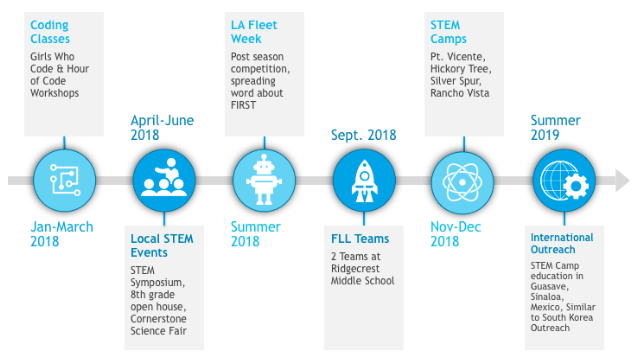 It was created to keep the central focus of FIRST Robotics Competition on the ultimate goal of transforming the culture in ways that will inspire greater levels of respect and honor for science and technology, as well as encouraging more of today’s youth to become science and technology leaders. Our team strives to be an inclusive team with a family-like environment. The parents and mentors put in a lot of time and effort to support us and help us be an inclusive team. There is always a job and place for anyone on the team. Our team also hosts team-bonding activities frequently to form even closer bonds between members. Our team also has high female and minority participation, with the leadership being made up of 55% females. We run many programs for younger kids in our community to spread knowledge and love of STEM and robotics. Annually, we run a STEM Camp for students of Hickory Tree School, as well as one for fifth grade students at a few schools in our area. At each STEM Camp, we spend each day guiding the students through activities to teach them basic principles of STEM and engineering. Our team also mentors two FLL teams at Ridgecrest Intermediate School; 30713, the Raider Rovers, and 30714, the Buccaneer Bots. In 2017, Team 2637 began to spread FIRST values to our immediate and surrounding community. After so many years of being supported, we wanted to take initiative to give back and grow the STEM in our area. Listed below are some of the events that we have done over the past two years.